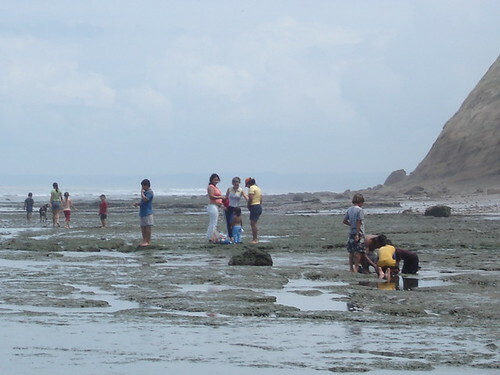 This week’s series of messages has looked at Ecuador beach property from Salinas beach in the south to Jama Ecuador in the north. 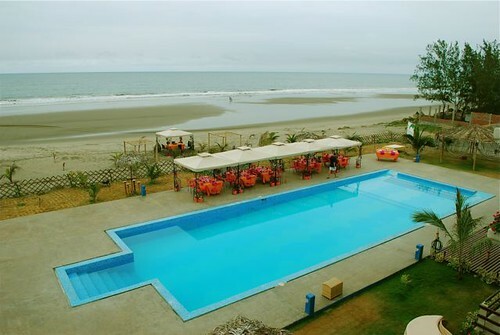 Almost in the middle of this Ecuador beach property is San Clemente, the village where Merri and I have invested. An excerpt of this map at maps.google.com shows the strategic position of San Clemente (marked A) on Ecuador’s coast… almost mid way between Manta (The coast’s largest port) and Bahia de Caraquez (Ecuador’s first eco city). Also note the direct access to Quito by road. 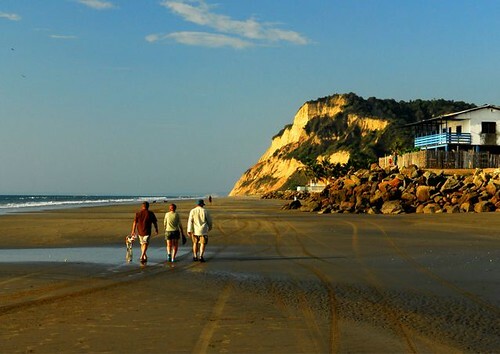 San Clemente is a small fishing village of approximately 2,000 inhabitants most of whom are families working in fishing or tourism. 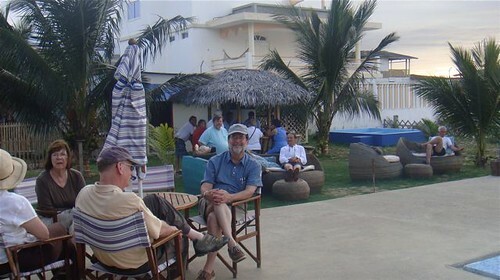 The town has six or seven excellent sea food restaurants… but all rustic. There is a bakery… pharmacy and a couple of smaller shops… but overall… the main benefit of San Clemente is its smallness and the beach. There is plenty of access to the city. 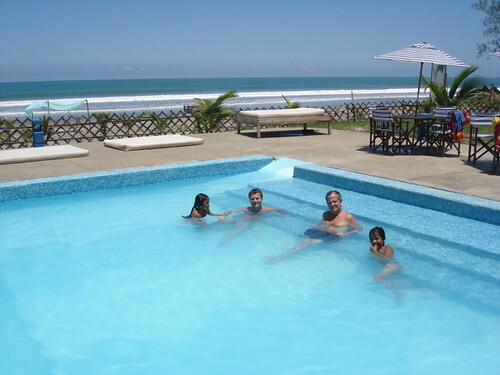 San Clemente is just 20 minutes away from the city of Bahia and 40 minutes from Manta. 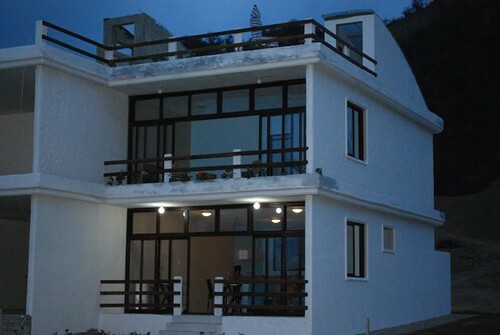 Manta has an airport with several daily flights to Quito, good medical clinics, a new shopping center as well as good hotels and restaurants. 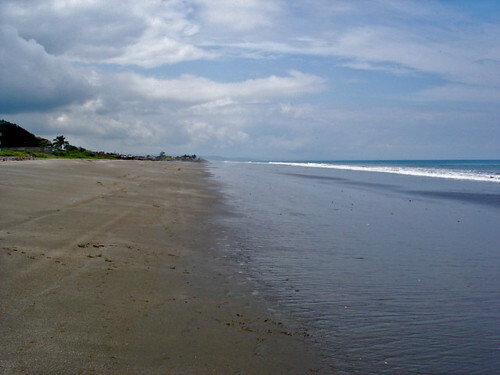 Puerto Viejo is also a large city about a half hour away. San Clemente however is the quiet place… good for retirement. 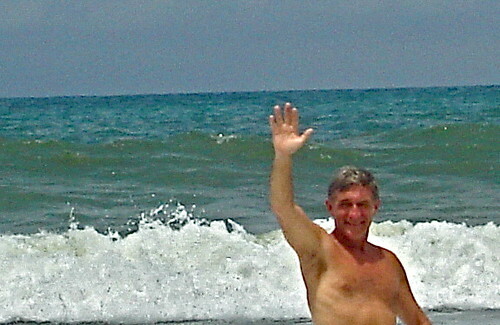 We wrote previously how Larry & Shirley Humphrey retired to live on the beach comfortably for $700 a month. Yet San Clemente is also a great place to bring up children. A previous message introduced Kjetil and Jessica Haugan. 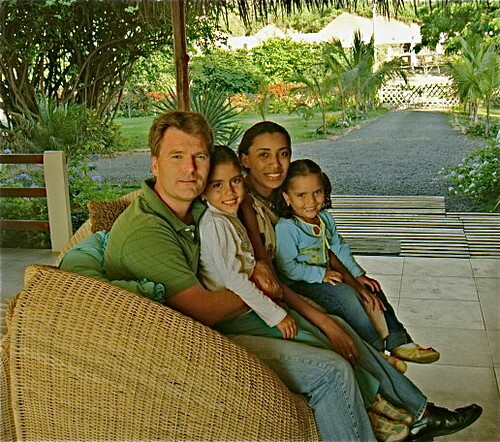 Here they are in the lobby of the Palmazul hotel and clubhouse with their daughters, Ingrid Atahala and Nina Alexandra. 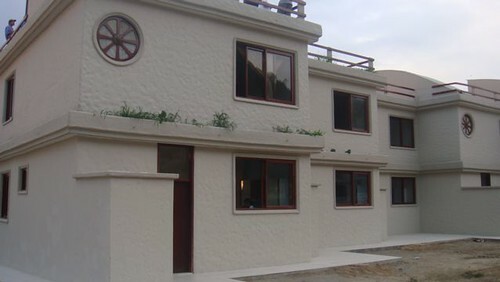 (Vistazul condos are in the background). Kjetil and Jessica have a travel business, Spanish schools, a company that runs a Galapagos tour agency and two boats that offer luxury Galapagos cruises. Kjetil is from Norway and after managing part of the Atlanta Olympic Village and living in Savannah, Georgia, moved to Ecuador 14 years ago. Merri and I have known Kjetil since he arrived. Another couple of friends with children who have a San Clemente condo are Trey and Courtney Morrison. Trey and Courtney come from near us in North Carolina where they were landlords, restaurant owners and real estate agents. 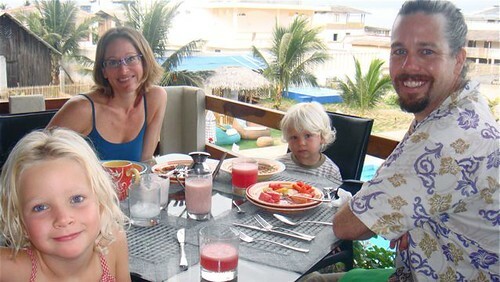 Here are Trey and Courtney with their children, Sydney and Michael eating breakfast at the Palmazul, the hotel and club house for the Vistazul condos. 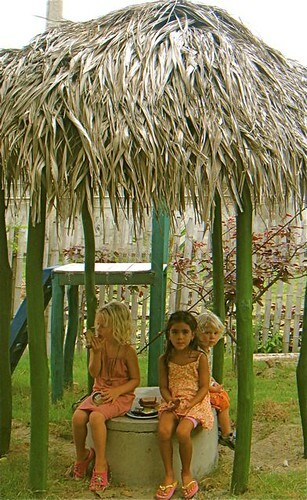 Michael, Sydney, Ingrid Atahala and Nina Alexandra at the playground of the Palmazul clubhouse. Merri and I walk towards the condos and clubhouse after a seafood meal on the beach. 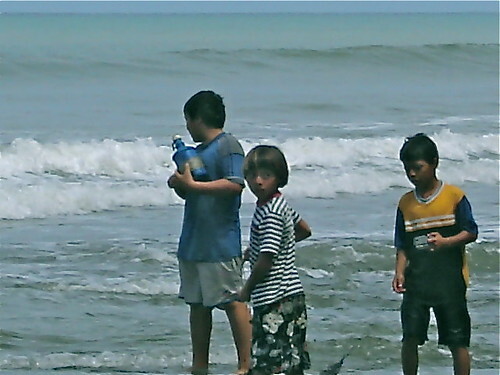 children enjoying a safe surf or lounging in the pool. 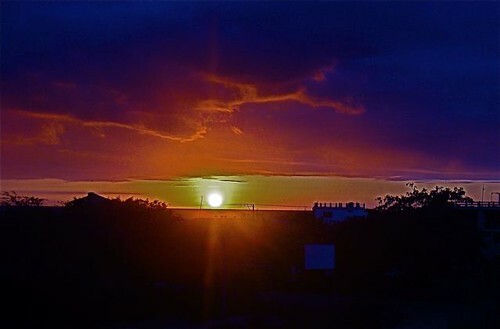 San Clemente is also great for watching quiet sunsets. This is wonderful, small town stuff! Yet not too far from the city. 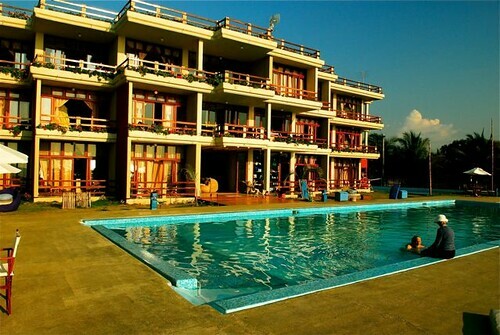 The weather is pleasant all year around. The dry season runs from June to December and is cooler. January through May has clear sunny days and more rain during the nights. 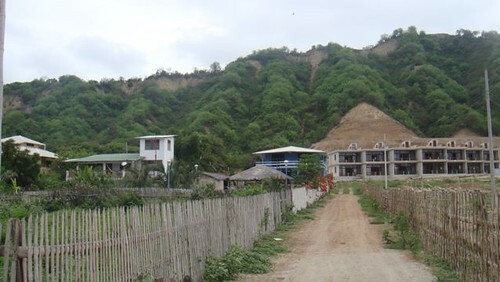 San Clemente is surrounded by farmland with tropical crops. 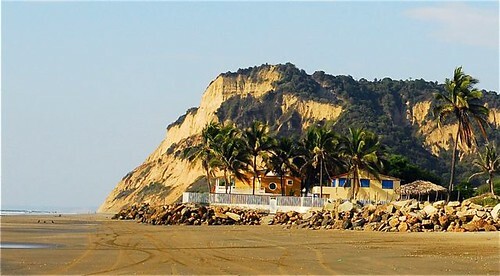 San Clemente is located in the province of Manabí which is known for its many ancient cultures and there are several archeological sites close to the development.